Want to improve your packaging line efficiency? With a small footprint and high-profile design, the SMH-150 is ideal for maximizing space and minimizing labor costs. This high-profile pallet wrap machine is best suited for smaller loads and delivers improved throughput and operator safety. Built to wrap up to 55 loads per hour, this stretch wrapper allows for increased versatility at every stage of your packaging line, from in-line to end-of-line to freestanding configurations. Pallets come off the turntable solid, stable and ready-to-ship, with limited risk for product loss or damage. 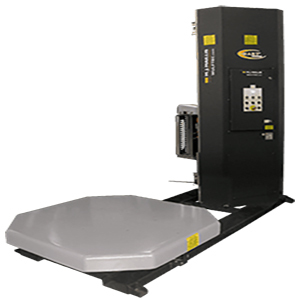 To learn more about the Wulftec SMH-150 Semi-Automatic Turntable Stretch Wrapper, give us a call at (609) 337-3641 or request a quote online. Equipment downtime is inevitable, and at Hughes Enterprises, we offer 24/7 on-site maintenance and support. Whether you’re looking for installation assistance, maintenance or emergency support, our factory certified technicians are available – whenever you need them.